At Offender Solutions® we are quite proud of what we have accomplished. Offender Solutions™ was founded through the combined 43 years of experience of a parole officer, a juvenile probation officer, a college instructor and a justice system policy analyst. Each of these roles contributed greatly to the style, delivery and content of the work we do. As you surely know, getting results with offenders is no easy task. We don't make ridiculous claims like a 95% success rate but we do know that we use best practices. 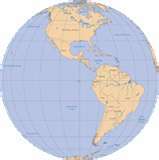 Offender Solutions® addresses victim issues, accountability and personal responsibility. Our approach is the most effective intervention - cognitive restructuring - and based on the ground breaking work outlined in "The Psychology of Stealing" and "The Psychology of Anger" by Steven M. Houseworth, MA. We know that of the thousands of clients who have gone through - and successfully completed - this program, 86% do not re-offend within one year. Of equal or greater importance is that 84% do not re-offend after two years. This low attrition rate suggests to us that "if" the client gets it, he really does get it. We are proud of our work and expect you will be pleased with our offender solution. What: An online (internet) class. Who: For adult or juvenile clients who need to complete a class for a court / probation officer / retailer / school / other persons, or for anyone who wants to get help on their own. When: Anytime, at the client's convenience. 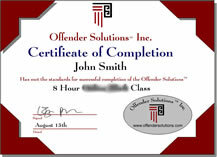 Program description: Offender Solutions® classes are designed for juveniles and adults who, for one reason or another, need to complete a class as the result of their behavior. Typically people who take an Offender Solutions® class have been required to do so by a judge, probation officer or school. The class is done completely online or by way of a correspondence workbook. There are several chapters to read (depending on the class). Each chapter ends with a quiz that must be completed before being allowed to progress to the next chapter. There is also a final exam. Immediately upon completion of the final exam a Certificate of Completion is activated and can be printed and used as confirmation of completion.